Your favorite product: Earrings made of steel 316L in silver colour, blue Swarovski crystal in the socket, 4mm AA41.19 - is added to the wish list. Steel earrings in silver colour with puzetovým polished stainless steel and with a round light blue krystalkem Swarovski in the shiny sleeve. If you are interested in this product, please click on the above button for redirecting to the online store. Check the price, it could change from our last update. 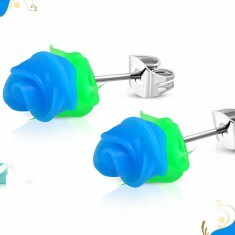 Your favorite product: Puzetové steel earrings, blue silicone rose with green petals SP27.17 - is added to the wish list. Earrings with puzetovým stainless steel made of steel 316L, flexible silicone flower - blue roses, green leaves. 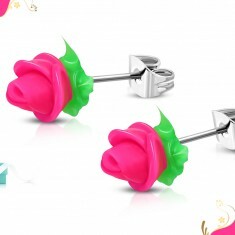 Your favorite product: Earrings made of surgical steel neon pink silicone rosebud, green leaves SP30.07 - is added to the wish list. Earrings with puzetovým stainless steel made of steel 316L, flexible silicone flower - neon pink rose with green petals. Your favorite product: Puzetové steel earrings, dark purple rose with green petals SP30.11 - is added to the wish list. Earrings with puzetovým stainless steel made of steel 316L, flexible silicone flower - dark purple roses, green leaves. 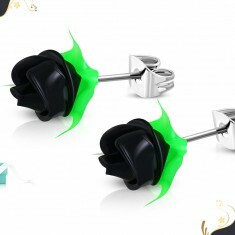 Your favorite product: Steel earrings, black silicone rose with green petals, puzetky SP31.04 - is added to the wish list. Earrings with puzetovým stainless steel made of steel 316L, flexible silicone flower - black rose, green leaves. Your favorite product: Earrings made of surgical steel, red silicone, rosebud, green leaves SP32.06 - is added to the wish list. 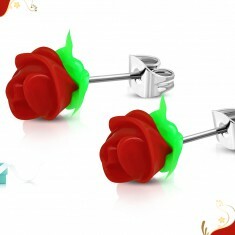 Earrings with puzetovým stainless steel made of steel 316L, flexible silicone flower - red rose with green petals. Your favorite product: Earrings made of surgical steel, purple silicone, rosebud, green leaves SP74.06 - is added to the wish list. 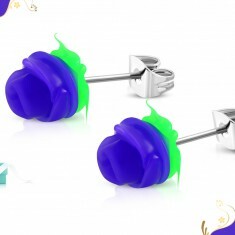 Earrings with puzetovým stainless steel made of steel 316L, flexible silicone flower - purple roses with green leaves. Your favorite product: Pendant surgical steel, corrugated strip with three čirými cubic zirconia AA09.29 - is added to the wish list. Pendant made of steel 316L in silver colour, the vertical wavelet decorated with a trio of wagered clear zirkonků. 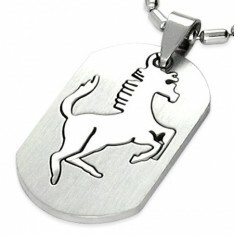 Your favorite product: Pendant surgical steel silver color, carved horse AA05.29 - is added to the wish list. Pendant made of steel 316L, rounded rectangular sign with a carved motif of a horse, a silver shade. 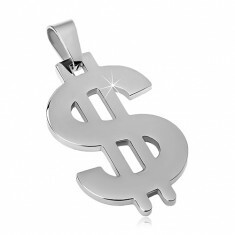 Your favorite product: Pendant made of steel 316L in silver colour, the symbol of the dollar G13.17 - is added to the wish list. Pendant surgical steel, silver shade and shiny finish, the theme of the dollar. Your favorite product: Steel pendant silver color, large grain with a cutout in the shape of a dragon AA07.21 - is added to the wish list. 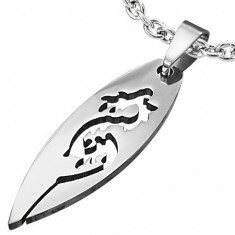 Pendant surgical steel, mirrored glossy large grain with a carved motif of a chinese dragon. Your favorite product: Pendant surgical steel silver color, rectangle with cutouts in the shape of a marijuana AA07.27 - is added to the wish list. 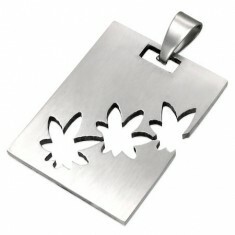 Square pendant made of steel 316L, carved motif of three marijuana leaves, glossy surface silver color. Your favorite product: A rectangular pendant made of surgical steel with asymmetrical cut-outs of the G12.13 - is added to the wish list. 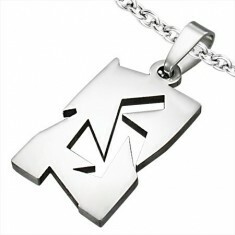 A steel pendant in a silver hue, a shiny rectangle with irregular geometric cutouts. 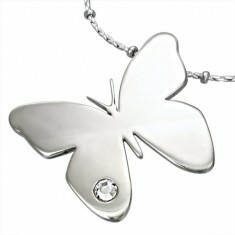 Your favorite product: Pendant surgical steel, glossy butterfly with clear zirkonkem G2.17 - is added to the wish list. 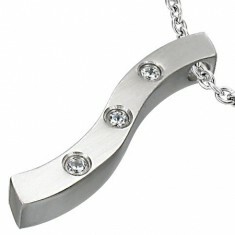 Pendant made of steel 316L bow - tie with a smooth, glossy surface silver color and the amount a round zirconia. Your favorite product: Pendant surgical steel silver color, shiny hearts with cutouts and zirconia G9.13 - is added to the wish list. 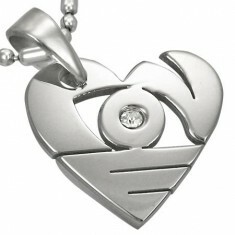 Pendant made of steel 316L, asymmetrically carved a heart with amount round zirconia sheer color.